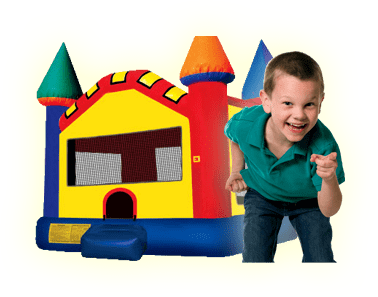 27' Purple Crush Dual Lane Water slide with Pool and Slip and Slide | Bounce Houses R Us | bounce house rentals in Elmhurst, Illinois . 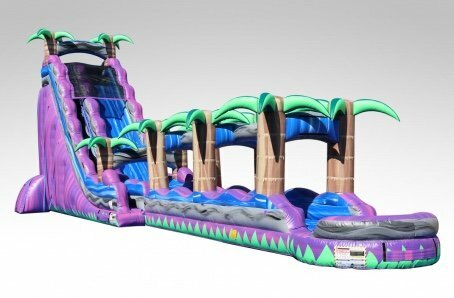 Book our fun filled action packed 27' Purple Crush Dual Lane Water Slide with pool and slip and slide. This dual lane water slide is sure to satisfy all thrill seekers as they climb to the top slide down, enter the slip and slide and end with a splash in a pool of water. This is sure to be a hit at any summer time event. Requirements: A water source with a water hose that will reach where you would like the unit set up. If we need to bring it through a gate or pathway, it must be at least 36 inches wide. 28 feet of air space above the setup location must be completely clear of branches, power lines, or any other obstacle. Outlets: 3 standard (20 amps) 110 volts GFCI outlet within 100 feet of the unit. Generator rentals are available here if you do not have a electricity supply. Setup location: Please specify when you are booking the 27' Purple Crush Dual lane Inflatable Water Slide if you will be setting up on grass, or asphalt/concrete at the time of booking. All anchors need to be secured using metal stakes or sandbags. We prefer ground stakes when possible but if that is not an option we will anchor using sandbags. The 27' Purple Crush Dual Lane Inflatable Water Slide requires a flat surface for installation.